Summer. The season when nature's bounty is at its greatest. The time for juicy tomatoes, backyard-grown herbs, squash galore, and of course mountains and mountains of berries and fresh fruits. Although I tend to sway savory when I head out for brunch, every once in a while I can be convinced to swear allegiance to the almighty waffle. 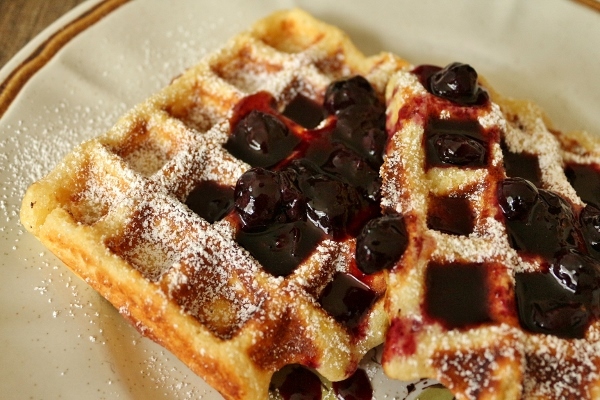 I prefer waffles made in a Belgian-style waffle maker because they have deeper pockets for holding syrups and toppings, and also tend to have a slightly crisper texture because they are less doughy. 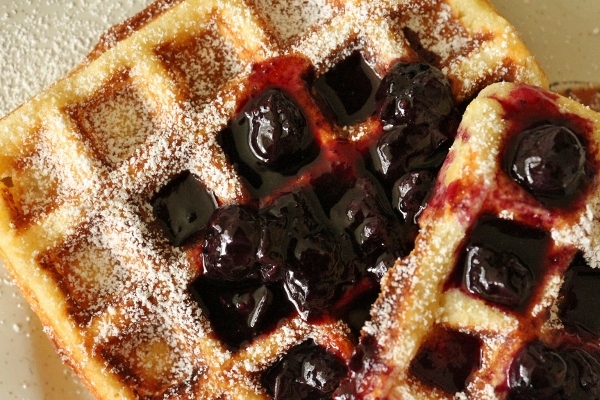 Belgian waffles are traditionally small rectangles, but most Americans expect their Belgian waffle to be served as a giant round. Either way works fine, but I use my tiny little Belgian waffle maker that makes 2 waffles at a time. It gets the job done, and I can easily keep the waffles warm in the oven as I finish cooking. For a party, however, it would be best to invest in something bigger, or perhaps borrow a friend's waffle maker and have two going simultaneously. 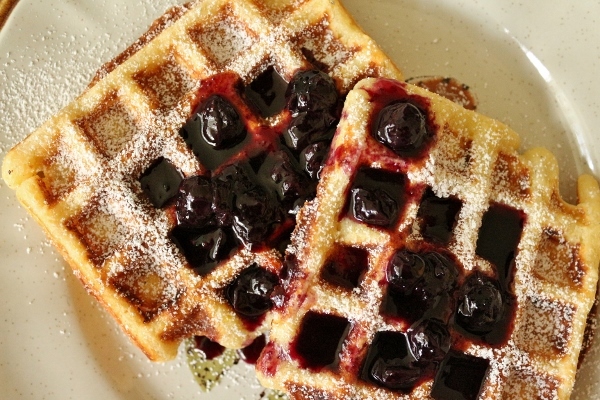 Lemon-Ricotta Waffles with Blueberry-Citrus Syrup are absolutely perfect for any summer weekend. 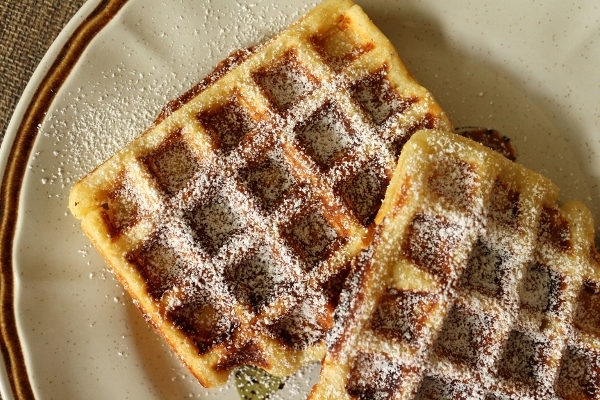 The waffles themselves have a fantastic texture, heightened by a bit of crunchy cornmeal and creamy ricotta cheese. Buttermilk adds tang, while a generous amount of lemon zest and lemon juice add beautiful brightness in flavor. Don't even get me started on the Blueberry-Citrus Syrup. Nothing this good should be this easy to make. 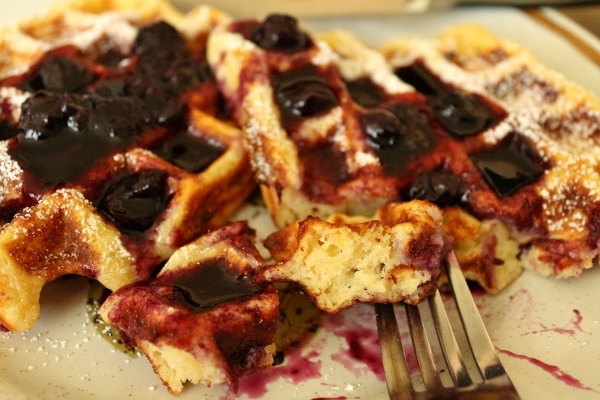 Water, brown sugar, strips of lemon zest, and blueberries bubble together to create a slightly citrusy berry-laden syrup that really elevates these waffles to another dimension. This is definitely a more summer spin on syrup than your standard maple variety. I know this is a pretty bold statement, but these waffles just might be my favorite waffles I've made thus far. 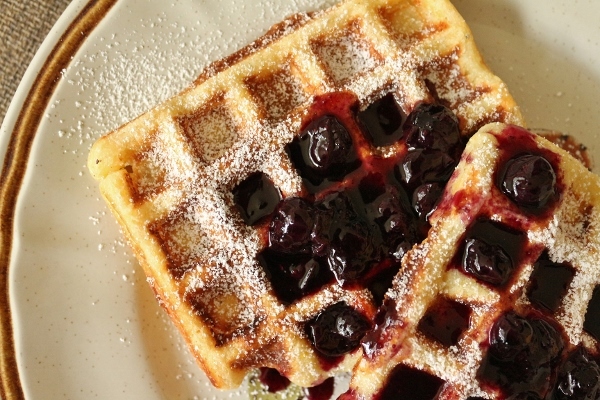 I'm always trying different recipes, and honestly all of the ones I've shared in the past--from tangy Yogurt Waffles with Honey Cream to traditional Belgian Liège Waffles, citrus-infused Sour Cream-Orange Waffles to autumnal Pumpkin Waffles with Sour Cream and Toasted Pumpkin Seeds--are all really fantastic recipes. Yet these waffles may be a step above the rest. What I love most about them is that they're not too sweet (really none of the ones I've shared above rank high on the sugar scale) and yet feel light and decadent all at once. Definitely try these next weekend. You won't be sorry. 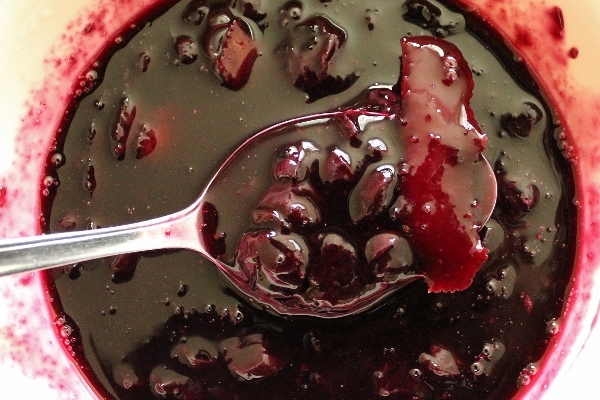 To make the blueberry-citrus syrup, place 1/4 cup (2 fl oz/60 ml) water and the brown sugar in a small saucepan over medium heat. Add the blueberries and lemon zest and bring to a simmer. Cook until the berries pop and form a thick syrup, about 5 minutes (it will thicken more as it cools; remove lemon zest strips before serving). In a medium bowl, whisk together the egg yolks, buttermilk, and butter. Gently stir in the ricotta, lemon zest, and lemon juice. In the bowl of a stand mixture using the whisk attachment, whip the egg whites on medium-high speed until soft peaks form, about 3 minutes. Stir in the granulated sugar and whip until stiff peaks form, another 2 to 3 minutes. In a large bowl, mix together the flour, cornmeal, baking powder, salt, and nutmeg. Make a well in the center of the dry ingredients, and pour in the egg mixture, stirring until just combined. Gently fold in the egg whites. Ladle (or scoop) the batter into the waffle maker, using 1/2 to 3/4 cup batter per batch (my waffle maker takes a heaping 1/3 cup per waffle square). Spread the batter so it almost reaches the edges of the waffle maker. Cook until the waffles are crisp and browned, 4 to 6 minutes. 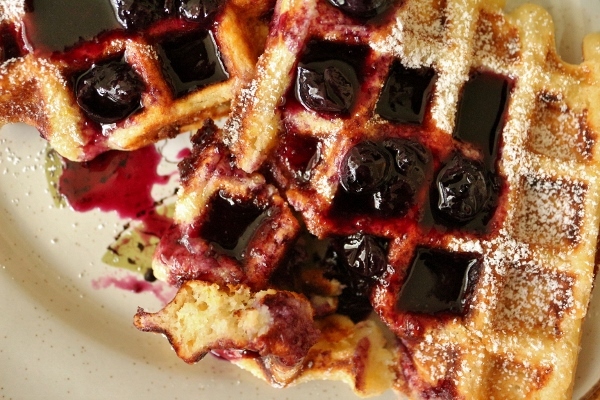 These waffles tend to be slightly wet, so you have to cook them a little longer than usual. 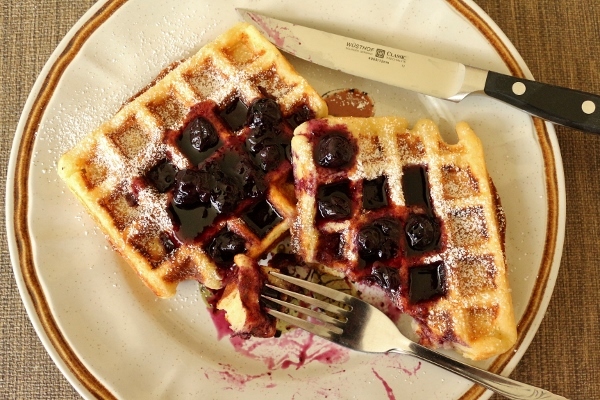 Using a spatula, remove the waffles from the waffle maker and serve right away, or place on a baking sheet in a single layer in a 200 degree F oven for up to 20 minutes before serving. 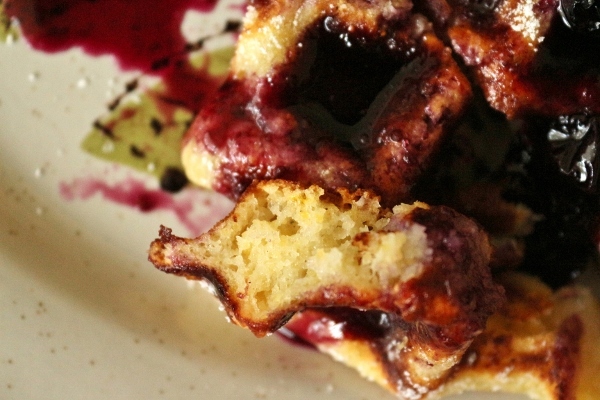 Drizzle with the blueberry-citrus syrup, and dust with confectioners' sugar. Cook's Note: The measurements in this recipe are directly from the book, however the ounce and gram conversions are generally not very accurate, especially for the larger values. It seems as though whoever did the conversions just tried to round to the closest number, but in some cases it's vastly different. For example 185 grams of ricotta cheese is closer to 6.5 ounces, not 6, but 60 grams of sugar is 2.1 ounces, so that's at least much closer to 2. I'm not sure which measurements were the author's original, however, I use the gram measurements and find those to yield good results.